What Did People Say, Redrow? The Redrow Public Consultation ended on 23rd Sept. Everyone who spoke to us or that we heard making comments was fiercely opposed to ANY DEVELOPMENT. But we may be mistaken?? OK REDROW, we would like to know what the results were, what people contributed and their feelings about your development. Their lead PR contact Charlotte Morris went on holiday for 3 weeks immediately after the public event in Liverpool on 16th Sept – and before the consultation period ended – so we can’t ask her!! 1. 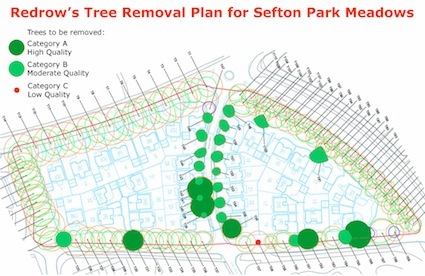 Follow this link and contact Alex Wood, Redrow Director, or one of his colleagues to ask for the consultation results for Sefton Park Meadows. Demand that they are made public. 3. We grilled Redrow at the public event on 16th Sept about protection for the trees around the Meadows. They should be safe under Tree Preservation Orders (TPOs), they are in a Conservation Area, but housing development on this site cannot be successful without felling these trees. Redrow’s statement that ‘trees would be retained, where possible’ was not reassuring. Director Alex Wood was less than convincing when questioned. Trees may be ‘sold’ with housing plots to each owner, and their care go to a ‘management agency’. No details were available for their protection during construction when large machinery would need access. Access to driveways and internal parking was shown on their online design plans. John Davies, Meadows campaigner, has enlarged one of these and shows in detail how driveways would impact on the greenspace. 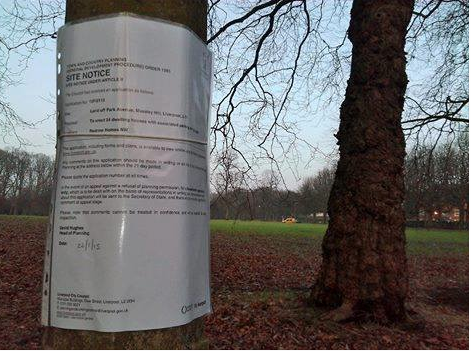 Contact Liverpool City Council Conservation Office Enquiries AND/OR your local councillor, and demand that trees be protected at Sefton Park Meadows. Categories: Objections, Planning Process | Tags: campaign, conservation, council, environment, housing development Liverpool, Joe Anderson, Liverpool greenspaces, Loss of open space, meadows, Redrow, Redrow consultation, Redrow consultation the Meadows, Redrow Homes in Liverpool, Redrow Public event, Sefton Park, Sefton Park Meadows campaign, Sefton Parklands campaign, sell off Liverpool | Permalink. Over 400 of us answered Redrow’s call to come and comment on their housing plans for Sefton Park Meadows on Tues 16th Sept.
Only problem? There were no detailed plans to comment on! We were shown 5 boards with information on such as Liverpool’s planning documents, the benefits of housing in the Mossley Hill area, a basic ( to say the least) aerial view of the Meadows with 30+ small blue boxes aligned on it, (representing 55 units, including apartments) and a few random housing styles that may be included – or not. See the boards here on the Redrow online consultation website. THANKS TO THE HUGE NUMBERS OF LOCAL PEOPLE WHO CAME TO TELL REDROW THEIR VIEWS. Special thanks to Liverpool Taxi Drivers Alliance and Socialist Singers. MAYOR ANDERSON WAS NOT SPOTTED. Categories: Objections, Planning Process | Tags: campaign, conservation, council, disposal, environment, green, housing development Liverpool, Joe Anderson, Lexington and Redrow, liverpool, Liverpool City Council, Liverpool greenspaces, meadows, Park Avenue, Redrow, Redrow consultation, Redrow Homes in Liverpool, Sefton Park campaign, Sefton Park Meadows, Sefton Park Meadows campaign, sell off Liverpool | Permalink.